The range of the basic d.c. voltmeter can be extended by using number of multipliers and a selector switch. Such a meter is called multirange voltmeter and is shown in the Fig. 1. The R1, R2, R3 and R4 are the four series multipliers. When connected in series with the meter, they can give four different voltage ranges as V1, V2, V3 and V4. 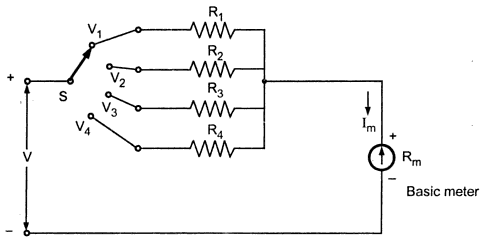 The selector switch S is multiposition switch by which the required multiplier can be selected in the circuit. More practical arrangement of multiplier resistances is shown in the Fig.2. In this arrangement, the multipliers are connected in series string. The connections are brought out from the junctions of the resistances. The selector switch is used to select the required voltage range. When the switch S is at position V1, R1 + R2 + R3 + R4 acts as a multiplier resistance. While when the switch S is at position V4 then the resistance R4 only acts as multiplier resistance. The V4 is the lowest voltage range while V1 is the maximum voltage range. In position V4, the multiplier is R4 only. The total resistance of the circuit is say RT . In position V3, the multiplier is R3 + R4. In position V2, the multiplier is R2 + R3 + R4. In position V1, the multiplier is R1 + R2 + R3 + R4. Using equations (1), (2), (3) and (4) multipliers can be designed. The advantage of this arrangement is that the multiplier except R4 have standard resistance values and can be obtained commercially on precision tolerances. The first resistance i.e. R4 only is the resistance having special value and must be manufactured specially to meet the circuit requirements.